You’ll find a selection of the day’s best deals below, but for more, be sure to visit Kinja Deals. External Bluetooth transmitters and receivers with 3.5mm jacks have been around for years, but Etekcity’s new model raises the bar with support for optical (SPDIF) audio. The little box can both receive and transmit Bluetooth signals and includes SPDIF in-and out-ports to connect it to your TV or high-end audio equipment. Plus, it can even pair to two pairs of headphones simultaneously when transmitting, which would allow two people to, say, listen to the same TV over headphones to avoid waking up someone in the next room. Just be sure to use promo code 8ERM3WE3 at checkout to save $20. We see deals on leaf-style HDTV antennas pretty frequently, but if you won’t settle for anything less than the brand that started the trend, Amazon’s discounting two different Mohu Leaf models today. The model you buy will basically depend on how far you live from your local broadcast towers. The Leaf Metro and Leaf are rated for 25 and 30 miles respectively, but keep in mind that those are under ideal circumstances, and your actual range will likely be shorter. You’ve probably heard a lot of fuss about mechanical keyboards lately, and if not, you’ve at least heard the clicking. If you’re curious to try one yourself without dropping a bunch of money, here’s an entry level model (with number pad) for $40, one of the best prices we’ve ever seen on any mechanical keyboard. The keys don’t use name brand Cherry MX switches (unsurprising at this price), but the switches it does include should closely mimic Cherry MX blues, which are tactile, loud, and great for typists. Anker’s SoundBuds are our readers’ favorite affordable Bluetooth headphones, and the newest version just dropped to an all-time low price. The SoundBuds Slim are, as you might have gleaned from the name, far smaller than the originals. Heck, they look like a small set of wired earbuds; you might never guess there were batteries and Bluetooth radios in there. Despite the size, these buds are still rated for seven hours of battery life and recharge fully in just 90 minutes. There was a $6 launch day discount on these a few weeks ago that dropped them to $24, but if you missed out on that sale, they’re slashed to $22 today, no code required. Miniature LED flashlights are so cheap and ubiquitous now that there’s no excuse not to have one tucked away in every glove box and every room of your house. Get four zoomable lights from OxyLED for just $14 today. These dryer balls have an astounding 12,000 Amazon reviews at a 4.6 star average, and are unsurprisingly Amazon’s top-selling item in the fabric softener category. Like, good for them, but how does such a boring product get that much attention? Anyway, you can get a half-dozen for $12, or $5 less than usual, while supplies last. With a good set of silicone cooking gloves, you’ll have full-finger control when you handle hot pans in the kitchen. Hell, you could use them to just pick up a piece of meat directly off the grill, like some sort of barbecue superhero. For $7, why not? Go to your nearest home goods store, and you’ll find dozens of airtight containers to keep food and coffee fresh. But the Friis coffee vault takes things one step further with a valve and filter that lets your roasted beans vent off carbon dioxide without opening the lid, which keeps them fresher longer. 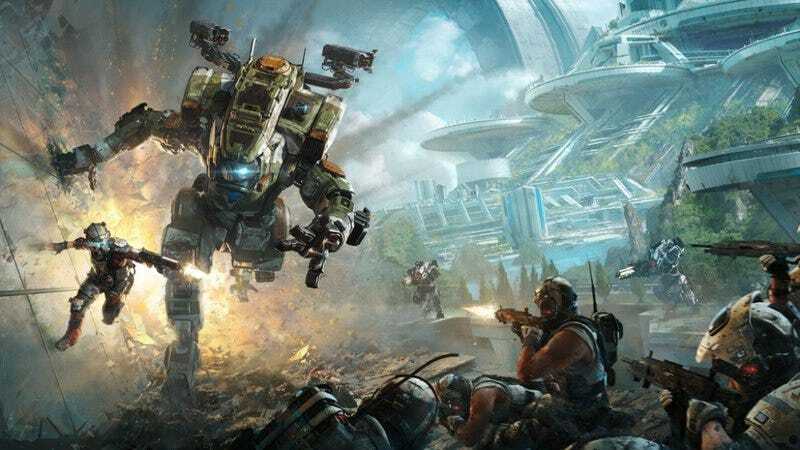 Amazon had digital downloads of Titanfall 2 for $24 on Xbox One yesterday, but now, the PS4 version has joined in the fun. If you like shooters, it’s a no-brainer at that price, even if only for the campaign. For the rest of today’s best deals, be sure to head over to Kinja Deals.